Would a trading system that provides 75% expected winners and 6 simple option trades a month be what you've been searching for? 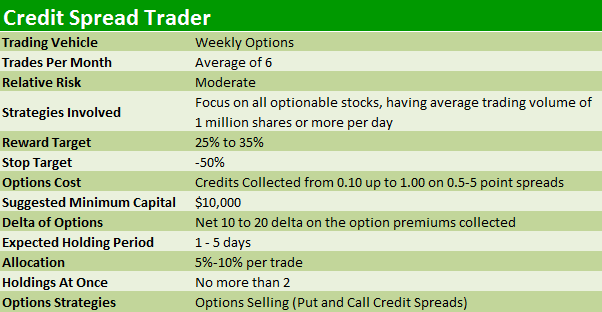 Credit Spread Trader employs credit spreads to achieve consistent income in both bull and bear markets by selling time premium on short-term options in a proven limited-risk, high-probability strategy. This service uses put and call credit spreads to bring in consistent gains on highly liquid weekly options with a maximum holding period of 7 days. The time decay of option premium is in our favor and produces quick profits for subscribers each and every week. Another major advantage of Credit Spread Trader is in its dependability. While new trades can trigger on any trading day, our use of daily charts for entries means that trades are always released between 3:00 ET and 3:45 ET in the afternoon, thus avoiding the need to constantly check your email or texts for new recommendations. Credit Spread Trader aims to release 1-2 credit spreads every week, aiming to generate gains of 20% to 35% by that week's expiration. Real-time intraday e-mail/text alerts whenever we spot a new trading opportunity. These can be auto-traded for no extra cost through TD Ameritrade/thinkorswim and AutoShares, call 1-800-244-8736 for information. We never leave you hanging on a trade. We provide educational video updates each week which give you the rationale behind any new trade, including reviews of ALL open positions. You will also receive unlimited e-mail and phone access to your Trading Consultant for the full term of your service. Have a question about a trade or the program? Ask your Trading Consultant. Available for trading in IRAs and self-directed brokerage accounts rolled over from 401ks and other retirement accounts. Also, your subscription price may be 100% tax-deductible – check with your tax professional. Plus, by purchasing this service, you may be eligible for future discounts under the BigTrends Loyalty Program! Click here for more information on how you can save $100 for every $1,000 spent! Trend Watch, TRENDSCORE, webinars, technical analysis e-book, and more!